WHAT IS THE GET JEALOUS HAIR LOYALTY CARD? 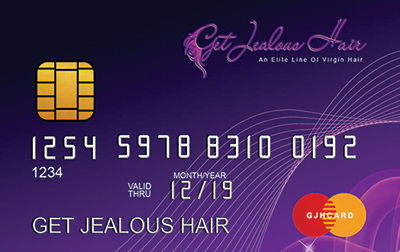 THE GET JEALOUS HAIR LOYALTY CARD IS A LOYALTY CARD THAT ALLOWS YOU THE PERKS OF SAVING AN UNLIMITED 15% OFF OUR ENTIRE SITE. WITH AN INITIAL $50 OFF YOUR FIRST TRANSACTION. 15% OFF IS A DISCOUNT YOU CAN'T MISS OUT. HOW DO I BECOME A LOYALTY CARD MEMBER? YOU MUST BE A LICENSED COSMETOLOGIST. PLEASE CALL OUR CUSTOMER SERVICE REPRESENTATIVE AT (845)-232-5224 EXT: 0 AND WE WILL SIGN YOU UP FOR YOUR LOYALTY CARD. CAN I REDEEM MY 15% WITH ANY SALES? UNFORTUNATELY, YOU CAN NOT REDEEM YOUR LOYALTY DISCOUNT WITH ANY CURRENT SALES. STEP 1: CHOOSE YOUR CHOICE OF HAIR, WIG OR CLOSURE. ONCE YOU HAVE SELECTED ALL YOUR OPTIONS. PLEASE SELECT THE LOYALTY MEMBER OPTION AND THEN ADD TO CART. STEP 2: ONCE YOU ARE DONE SHOPPING PLEASE PUT YOUR LOYALTY MEMBER CARD NUMBER FOUND ON THE BACK OF YOUR CARD IN THE VOUCHER CODE OPTION. STEP 3: ENJOY YOUR FIRST $ 50 OFF AND UNLIMITED 15% OFF AFTER EACH PURCHASE. © 2019 get Jealous hair. all right reserved. BECOME A GET JEALOUS HAIR ANGEL SIGN UP FOR OUR EXCLUSIVE EMAIL LIST AND BE THE FIRST TO KNOW ABOUT ALL OUR EXCLUSIVE DEALS, NEW ARRIVALS, AND HAIR TIPS! !